On April 29th a private members bill was introduced in the Nova Scotia Legislature by MLA Lenore Zann, NDP Critic for Human Rights, its purpose to address environmental racism in the province. The objective of the Bill is to consult with Mi’kmaw, African Nova Scotian and Acadian communities throughout the province in order to provide an opportunity for them to share their concerns andcollaborate with Government to devise strategies and solutions for addressing environmental racism. 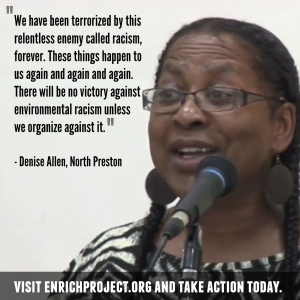 Environmental racism is the disproportionate location of polluting industries, sites and other environmental hazards close to racially marginalized communities and the working poor. These communities are among the most historically marginalized communities in the province. It has come to our attention that Minister of Environment Randy Delorey is not interested in supporting this Bill because it was introduced by opposition members. Our fear is that he may single-handedly bury it. WE CAN’T LET THIS HAPPEN — This is a disgrace and a major step backwards in addressing the problem of environmental injustice and specifically environmental racism in the province - especially in light of the progress that was made on April 29th. We need your help putting pressure on Randy Delorey and the other MLAs to move this Bill forward: this week is likely their last week in the House this session. If urgent action isn’t taken immediately to ensure that Bill111 is passed at Second and Third reading before the House finishes its current session in one week, the issue will be dead in the water. There is one simple way that you can support the passing of this Bill next week: Send an email to Randy Delorey, our MLAs and other key representatives in the Nova Scotia Government. Simply copy and paste the email template below, which includes a subject line, email addresses for government officials, and a text that you can modify if you choose. If you have the opportunity to speak to your MLA, stress the importance of and urgency in passing Bill 111. Be sure to ask your MLA to support the second and third reading of Bill 111 on the floor of the House during this session, which will end in one week. Sharing this action alert on Facebook and Twitter using the hashtag #NSBill111. The text of the Bill is available on the website for the NS Legislature here and status updates are available at the link here. 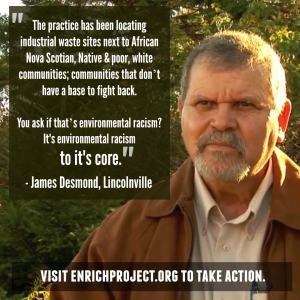 I am writing to you to share my concerns about the issue of environmental racism in Nova Scotia. As you may be aware a Private Member’s Bill was introduced on April 29th by MLA Lenore Zann, its purpose to address environmental racism – a longstanding issue in our province that disproportionately affects racially marginalized communities and the working poor. The objective of the Bill is to consult with affected communities throughout the province in order to provide an opportunity for them to share their concerns about environmental racism andcollaborate with the Government to devise strategies and solutions for addressing the issue. This is an important first step in addressing the long-standing issue of environmental racism in our province. We need our government to pass this legislation now in order to send the message that we the people have been heard and that this issue is an important one and that partisanship and further bias will not stand in the way of it’s passing. I urge you to support the passing of Bill 111 – ‘An Act to Address Environmental Racism in Nova Scotia’ at Second and Third Reading before the house finishes its current spring session. BILL 111 – ‘An Act to Address Environmental Racism’ came out of a meeting that Dr. Ingrid Waldron had with MLA Lenore Zann (Truro – Bible Hill – Millbrook – Salmon River)in January of this year. You can read the Bill in full here. Ms. Zann proposed that the introduction of a Private Members Bill could be the first step in addressing the concerns that Mi’kmaq and African Nova Scotian communities across the province have long had about the health effects associated with industries that produce toxic waste and other environmentally hazardous activities in their communities. It’s about time that someon e in government took this seriously, particularly since Bill 111 was received with much positive support upon its introduction by Ms Zann. Since last week it has come to our attention that Minister of Environment Randy Delorey is not planning to support the Bill and, therefore, will not ask his Liberal Cabinet colleagues to let Ms Zann introduce the Bill for Second or Third Reading which needs to be done in order for the bill to pass. Lenore is a Member of the Legislative Assembly representing the electoral district of Truro-Bible Hill-Millbrook-Salmon River since June, 2009. A popular and hard-working politician known for her integrity and compassion, in her capacity as NDP Critic for Education & Early Childhood Development Lenore has earned a reputation as a tireless advocate for Teachers, Educational Assistants and school staff, as well as affordable & sustainable Day Care. As Status of Women Critic she has become a popular speaker for Women’s rights, equality, entrepreneurship, and freedom from violence and sexual abuse (including human trafficking and Non-State Torture). As Critic for Film & TV and also Communities, Culture, & Heritage she has been a tireless champion for the Creative Economy. As Environment Critic she has been actively involved in preventing Fracking, the Alton Gas project, the spraying of Glyphosate on Nova Scotia’s woods, and Climate Change – in particular the mitigation of flooding. As Aboriginal Affairs Critic she has been an ally in the struggle for Mi’kmaq Rights, for the need to enact the Truth & Reconcilation Calls to Action in Nova Scotia, and the need to bring justice and an end to the shameful legacy of Canada’s “Missing and Murdered Aboriginal Women”. Lenore has also been active in creating more inclusive, affirming, and multicultural communities. 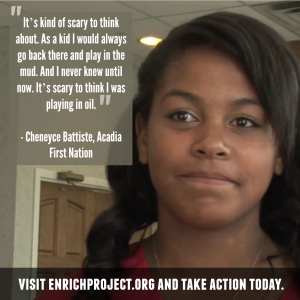 Her Private Member’s Bill “An Act to Prevent Environmental Racism” was the first of its kind in North America. Lenore has been active with her NDP caucus at creating anti-poverty legislation pertaining to greater financial equanimity to lessen the gap. On a personal level Lenore has devoted much of her time to Mental Health issues including the growing problem of youth addiction for which she was named a national spokesperson for the Canadian Alliance of Mental Illness and Mental Health. Lenore is also an award-winning actor, writer and producer with 33 years of experience in Film, TV, Radio, Animation, and Theatre. She now enjoys mentoring a new generation of young performers in her community. Lenore was honoured to be the recipient of a national ACTRA Award for Best Actor, a two Coast Readers Awards for her work as MLA in 2015 and 2O16, and the Duke of Edinburgh Gold Lifetime Award for Service to Community and Country.